This weekend somehow became about sisterly-bonding. I am not sure how this happened…as the last I’d heard, one sister was flying solo for the evening and decided to risk her life come over and jeopardize her gastrointestional integrity eat dinner with me. A dinner that I was responsible for preparing and serving. The serving part I can handle…I felt she was more than a little daffy brave for agreeing to eat whatever I put before her. I think she figured that she’d still have all day Sunday to recover if something went terribly, horribly wrong. I made Jack’s famous penne a la vodka…which I’ve made so often I actually have it (mostly) memorized. K: “FINE. I’ll make my point. After dinner and many one or two bottles glasses of wine and maybe several one or two grapefruit margaritas, we decided that a recent episode of ‘The Ghost Hunters’ was worth further investigation. Evidently, these ghost-guys got a spirit to roll a ball across a room and we figured if their spirit could do it, then our mother could probably drop-kick it down the hall and at least halfway down the stairs. Problem is, we couldn’t find a ball that my sister felt was lightweight enough for a spirit residing in the afterlife to drop-kick. (Evidently, there are specifics to this ability.) So, we called my other sister (who incidentally lives about an hour away) and demanded she drop everything, pack an overnight bag and head over to my place to complete our spiritual circle. Oh, and we told her she had to bring the BALL. We then went back into the garage, deciding in our liquor-soaked haze that Jeffrey’s dented half-inflated head of a kickball maybe wasn’t so bad after all. Problem was, I’d evidently put quite a lot of duct tape around it, in my hopeful attempt to have it outlive my yet-unconceived, unborn grandchildren’s grandchildren's children. By the time we wrestled it loose, it was stickier than…(oh...many, many one-liners come to mind…but…well, you get the idea). It was very sticky. Since we all agreed that the wall-to-wall carpet would undoubtedly hinder any ethereal ability to roll said ball, the consensus was that we’d need to place a protective (unsticky) layer of something around it to allow it to be freely drop-kicked to its full potential. I wanted to use plastic wrap. My sister (who’d just polished off the last of the bottle of red wine she’d arrived with) insisted that foil was more spirit-friendly. 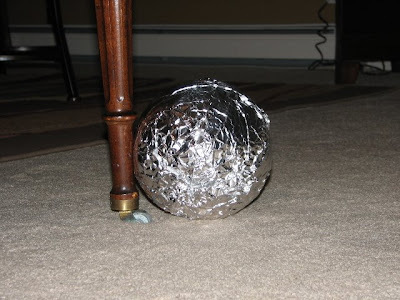 After 10 minutes of chanting and swaying, we left the ball smushed up against the leg of the piano and told Mom if she wanted to push it, she should go for it. It was 2:30am by then and we were ready to call it a night. We promised we'd check it in the morning." I believe it’s still there. 2 things.. I had to look up 'daffy', haven't heard it in 30 years. Also, did you think we wouldn't notice the styrofoam peanut? And FYI...that's no peanut, bay-bee! That's the wheel on the front leg of the piano...shows just how THICK that carpet is.